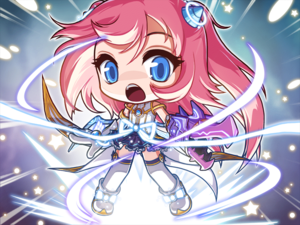 Angelic Buster is a DEX-based Pirate class, she is the second Nova race class to be released into the game. Players can only be female, since she is supposed to be the NPC named Tear, and have a choice between two hairstyles, two faces and any hair color. Angelic Buster uses her own weapon, the Soul Shooter, as well as a secondary weapon, the Soul Ring. She has an Emblem slot and a Dress Up System with her. She uses a system called Soul Recharge System, which replaces the use of MP. The easiest way to understand the Soul recharge system is to think of each skill as having a really long cooldown (forever). After using a Soul Battery skill (one that appears in the Soul Battery column, on the screen) you have a chance of either reducing the cooldown to 0, or not. If it does get reduced, the words "Recharge" appear above Angelic Buster and the skill can be used again. If not, "FAILED" appears above Angelic Buster's head, and the skill cannot be used until a recharge is successful. If all of your Soul Battery skills fail, you will have to use your basic attack until the recharge occurs. Whenever a recharge occurs, all Soul Battery skills recharge. This is why they recommend that you switch between skills - once the first one fails, try the second one. If that one fails, try another one if you have it. This way you maximize your damage by using active skills (that do, say, 200% damage or more) compared to your puny, albeit quick firing, regular attack. High mobility (grappling hook allows you to go upwards quickly, dash jump lets you leap horizontally quickly). Can teleport back to Pantheon every 10 minutes, where the portal can be used to reach almost anywhere in the game. Low damage at first and second jobs (not good for Aswan 40-60). This is because the first active skills only hit enemies one time. Screenshot of the flash animation, 17 days before release. Go through the tutorial, where you get equipped with the Soul Shooter and Soul Ring and then powered up by Eskalade, and then you end up at level 10. After you've acquired your new powers, continue to complete all of the quests in Pantheon. Working at the same time as Kaiser (your story intertwines with his), you will help push back Magnus' forces and delay Pantheon's demise. At lvl 30 you will advance to second job. When your work is complete in Pantheon, you will be able to move on to Maple World. Your first stop, since you're already 36, is to go to Kerning Square Shopping Center. After that, Eskalade will prompt you to go around and collect more gems to satiate his hunger. This page was last edited on 20 July 2014, at 20:22. This page has been accessed 45,579 times.